The production of monoclonal antibodies (mAb) and recombinant proteins has undergone significant progress in recent decades. Higher titers and increasing cell densities present challenges to upstream and downstream bioprocessing groups alike. In downstream processing, this challenge is quite clear (i.e., purification of larger product masses with currently available equipment/technologies is an on-going industry topic), but these changing conditions bring major challenges in upstream bioprocessing as well. 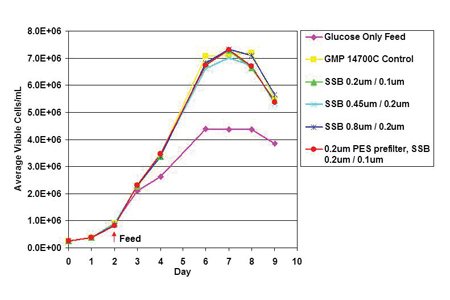 In some cases, mammalian cell culture media volumes are getting larger, but in others, media formulations are becoming more and more process-specific to where higher titers are observed and smaller volumes are needed, which is a situation conducive to single-use processing. Regardless of volume, these changes require improvements to media filtration technology to sterilize cell culture media entering the bioreactor as well as to improve process efficiency. Despite advances in sterilizing-grade filtration technology from filter manufacturers, many biopharmaceutical companies continue to utilize outdated technology, which is costlier and less efficient. Whether companies are looking into changing their media filtration operations to troubleshoot bottlenecks or to be proactive in reducing costs, this large volume step represents a major opportunity to upgrade technology. Optimizing the media filtration step also facilitates adaptation of the filters themselves into single-use processes because fewer amounts of filters are required (for example, moving from a multi-round housings to a single capsule that can be sterilized along with a single-use bag, if desired).